URDOMA, Russia – Russia's countryside and smaller cities have long been fertile ground for President Vladimir V. Putin and his message of restoring bygone greatness, but even here, there are limits. – abetted by secrecy, trickery and bending the law – have set off widespread protests. Underlying this winter of Russian discontent are deepening economic woes and a popular view that the government pours money into the glittering capital while squeezing the struggling hinterlands. It was only by chance that residents of Urdoma, 700 miles northeast of Moscow, learned last two local hunters stumbled onto workers felling lofty pine and birch trees to make way for it. The news galvanized Urdoma and dozens of other communities nestled among the forests of Arkhangelsk Province, and hardened attitudes toward the government. Polling shows that support for Mr. Putin is slipping, and for the first time in 13 years, a number of Russians think their country is moving in the wrong direction. Far removed from urban activists who protest government autocracy, public opinion has shifted most sharply in provincial areas, where Mr. Putin's popularity has stemmed from economic gains as much as from national pride. The government has made changes that are deeply unpopular nationwide, like raising the retirement age and increasing sales taxes and utility fees. Inflation-adjusted incomes have dropped about 11 percent over five years; a move in January by Russian producers to sell nine eggs at the price of 10 storms of mocking tweets. In Urdoma, population 4,750, and other towns in the region, resident say that the governor has sold their idyll to garbage interests, and the government – all the way up to Mr. Putin's office – has rebuffed their quest for answers. "They try to brush us away like so many flies," said Lyudmila Marina, a retired head of the local administration. So father, Mr. Putin has shown some signs that the disaffection was him, but a continued decline in support could present a long-term problem for him. Term limits require that he preserve the presidency in 2024, and he would need popular support to push through any change to extend his rule. For now, the question is how the disenchanted will channel their grievances, and what Mr. Putin will do about it. The cost of joining public protests against the government can be high. In January, Anastasia Shevchenko, a human rights campaigner for the opposition group Open Russia, was arrested in Rostov-on-Don, in southern Russia, on charges of working for an undesirable organization. , with Ms.
Protesting about garbage is considered a safer alternative. Yet brother political discontent simmered through scores of demonstrations held across Russia this month against rising garbage collection fees and the absence of ecological recycling methods. late January poll by the Levada Center, an independent Russian polling organization, showed that 45 percent of Russians thought the country was headed in the wrong direction, while 42 percent thought its course was correct, a sharp downturn from a year earlier. Approval of Mr. Putin's job performance stands at 64 percent, with disapproval at 34 percent. Any Western politician would love such numbers, but a year ago, the Russian leader had an 80 percent approval rating. "There is more displeasure expressed in the provinces, which were the foundation of Mr. Putin's support, ”said Lev D. Gudkov, director of the Levada Center. Mr. Putin often boasts that Russia is thriving despite Western sanctions that followed its annexation of Crimea in 2014. But last month the government revised its gross domestic product in an attempt to show faster growth in 2018, and experts cried foul. "People are ready to be great, but they are not ready to pay for their own pockets," said Vladimir A. Ryzhkov, a history professor and opposition politician. "For the first time since Putin came to power 20 years ago, life is not improving, but getting worse." Still, while people want change, said Ekaterina Schulmann, a political scientist at Ranepa, a university for technocrats, they "Are not going to storm the Kremlin." Aleksei A. Navalny, Russia's most popular opposition politician, announced the formation of a national trade union to fight for decent wages for doctors, nurses, teachers and other professionals, an unfulfilled Putin promise. Russians are suffering from a deep depression ”That promises to intensify even if it does not threaten Mr. Putin, wrote Mikhail Rostovsky, a columnist with the influential tabloid Moskovsky Komsomolets. "A society that has been used to such terms as 'Putin' and 'fat years' being interchangeable is suddenly facing a new, surprising reality." Members of Clean Urdoma, the group spearheading efforts to ban trash imports to Arkhangelsk, note that despite Russia's immense natural and pockets of wealth, many of its people live in poverty. space for a massive landfill. The authorities set out on Shyes, about 20 miles north of Urdoma, a village with only a railroad maintenance station left. Igor Orlov, the governor of Arkhangelsk, extols the project as much-needed investment that will bring 500 jobs. 19659006] A slick presentation developed by the city of Moscow said that the "communal waste" – it never mentions garbage – would be shaped into bales and wrapped in plastic, and that the landfill would be constructed to prevent pollutants from seeping out . It is designed to take 500,000 tons of garbage annually. Someone produced an attack video called "Traitors or Fools?" Related to others have linked lucrative garbage contracts to senior bureaucrats, suggesting corruption. After complaints that a public hearing was not held as required, residents of Urdoma awoke one day to discover scores of strangers bused into town. The outsiders entered an auditorium for a "hearing," while police officers barred residents from entering. 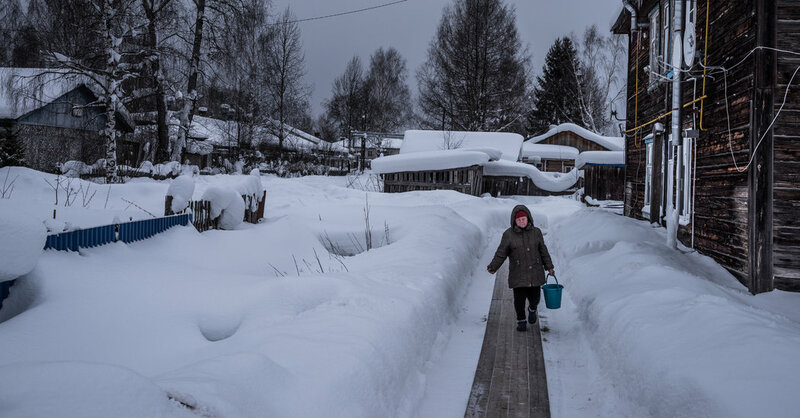 Unlike many Russian villages, Urdoma has a prosperous air, with newly built houses and a new school subsidized by Gazprom, Russia's state-run gas giant, which employs more than 530 local people. Residents argue that the village needs more jobs. Urdoma is removed from Moscow, more than 20 hours away by train. Gulag prisoners building the railroad first settled in the 1930s, essentially dumped in the woods and duty to survive. That ethos endures, with resident describing how they survive brutal winters feasting on mushrooms, berries and meat culled from the forest. In the current economic environment, they expect even less from Moscow, and disparage it more. For many people, ignoring the capital is no longer an option.